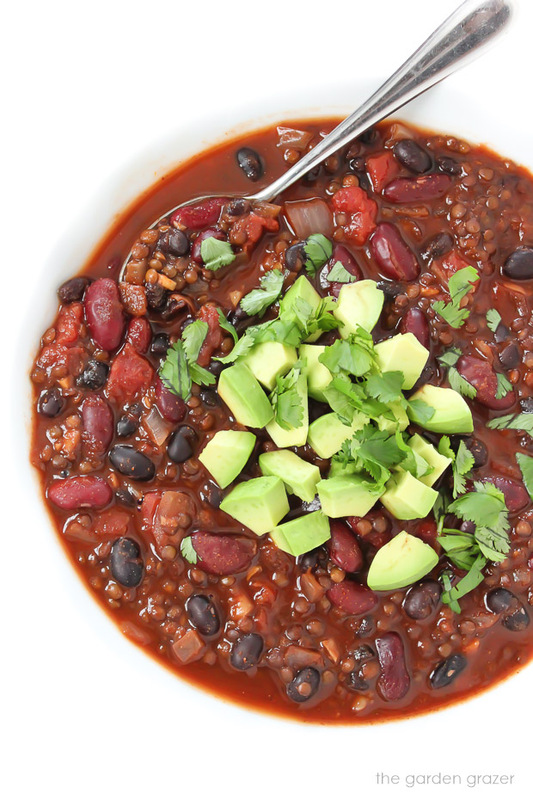 Easy bean and lentil chili packed with tons of plant-based protein and fiber! A satisfying meatless meal that’s vegan, gluten-free, and oil-free. 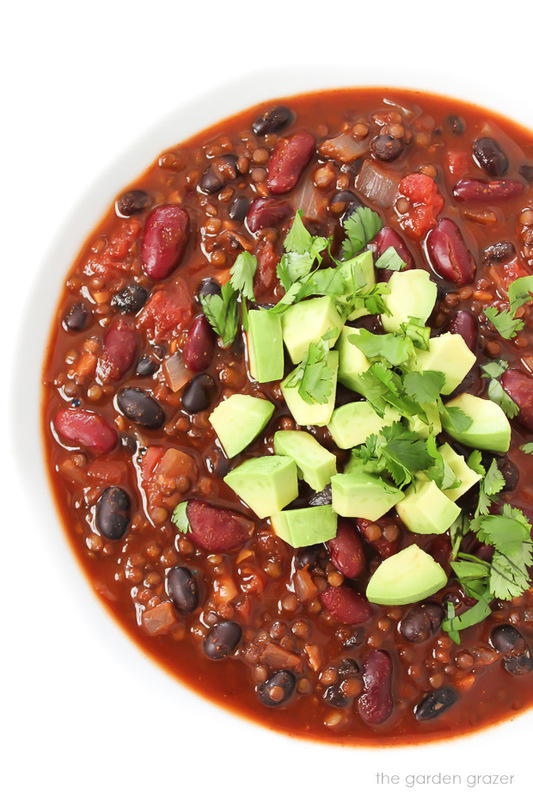 Simple, healthy vegan chili loaded with beans and lentils! This meal is packed with protein and fiber – an awesome combination that helps keep us both full AND energized. Not only are these tiny black beluga lentils adorable, but I love how they hold their shape while cooking (unlike other lentil varieties that can become mushy). Their dense texture adds such a hearty feel to the dish and makes it a great meat replacement. They’re not as common as other lentils so if you can’t find them, no worries, simply replace with brown lentils. This chili is great served as is, over baked potatoes (YUM), or mixed with brown rice/quinoa. I usually make a batch of rice or quinoa for the week to keep in the fridge and love stirring them in chili and soups. I know avocado on toast has been all the rage lately (I totally get it, I love it too)… but avocado on chili?? Be still my heart. So, so good. 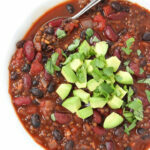 If you’re interested in more vegan chili recipes, I included some links below – enjoy! 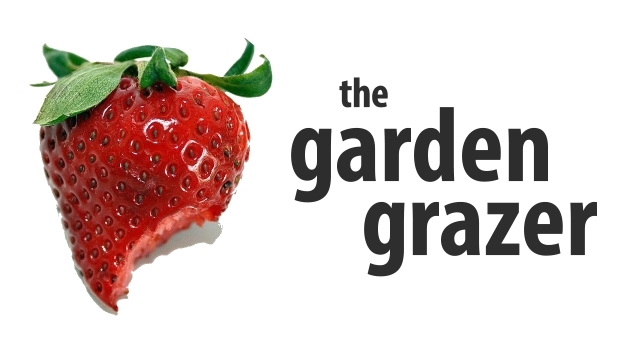 PS – come join The Garden Grazer on Instagram 🍓 and share a pic if you make this! I love seeing what you guys cook up. 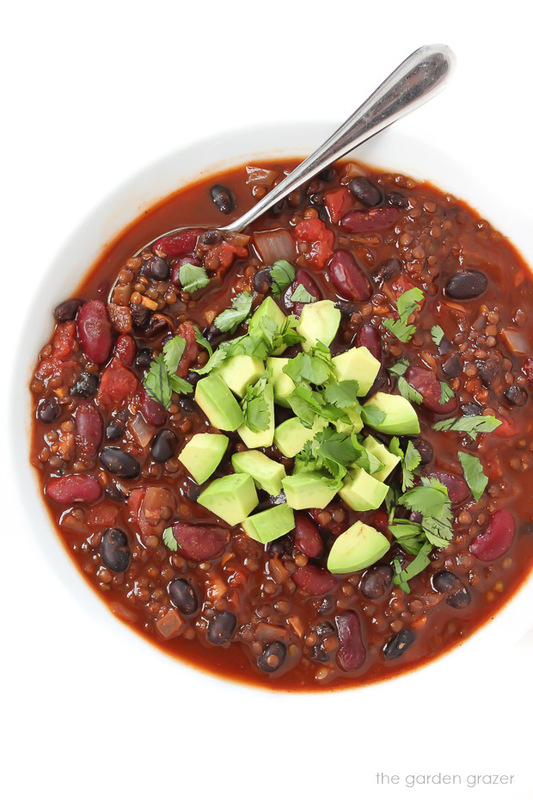 Easy bean and lentil chili packed with tons of plant-based protein and fiber! A satisfying meatless meal that's vegan, gluten-free, and oil-free. Avocado, green onion, cilantro, hot sauce, tortilla strips, dairy-free cheese or sour cream, etc. In a stockpot over medium-high heat, saute onion (I use water/veggie broth to saute) for about 8-10 minutes or until soft and translucent. When onion is soft, add chili powder, cumin, and garlic. Saute 1-2 minutes. Add vegetable broth, diced tomatoes with juice, and tomato sauce. Rinse and drain both beans and lentils. Add to pot. Increase heat and bring to a light boil. Reduce heat to med-low, cover, and simmer for about 25-30 minutes or until lentils are tender. Salt to taste and serve with any desired toppings. Optional additions: 1 tsp. smoked paprika, zucchini, bell pepper, organic corn, sweet potato, jalapeno, etc.